SlugFest Games - En Garde Reforged Available Now! En Garde Reforged Available Now! 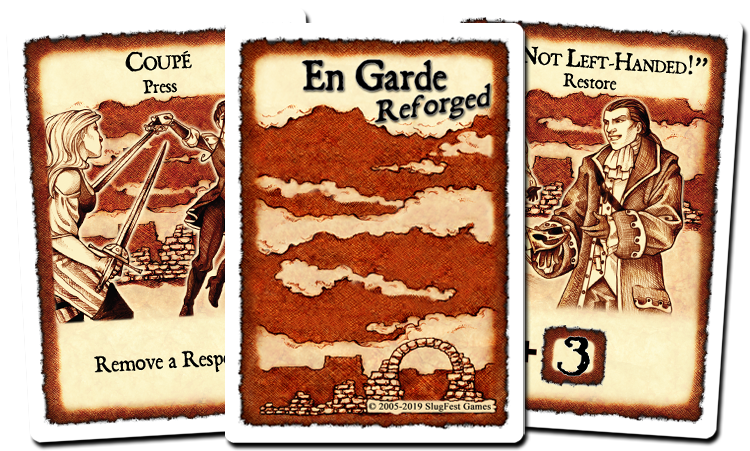 En Garde Reforged is now available on DriveThruCards! This modern reboot of the SFG classic was made possible by our fans on Kickstarter. You play as an impeccably-dressed Renaissance-era duelist with a score to settle. Vanquish your opponents with powerful attacks and avoid your enemies’ attacks with your expert skill. Should you find yourself becoming unkempt and fatigued, pick up a second sword or a buckler to regain the upper hand. If things get really bad, you could always pull out your pistol… That would even the odds! When the battle has ended, will you be the last one standing, or will your second have to drag you off the field? How to Duel – Where we break down the card types and mechanics as well as feature a fancy, animated example of play! En Garde Reforged – Where we talk about the new design choices and how we approached modernizing the mechanics. So if your a long-time fan who was desperate to relive a classic, or a brand new player looking for a fast and dirty sword fight straight out of Robin Hood, the wait is over! Order your copy today! « GII Design Contest Winners!